1. 10 Vacation rental apartments, located in a very quiet street at the center of Tel-Aviv, only 1 minute walk to Tel-Aviv beach. 3. Brand new spacious (75m²) modern vacation rental apartments on a brand new building (since 2010) with an elevator. 4. Balcony (8m²) with a side view of Tel-Aviv beach. On a brand new building, 1 min. walk to Bugrashov Beach. Luxury 75 m² air-conditioned suite, with 2 bedrooms (Queen size bed on each room with Sealy Posturepedic Mattresses), living room (with double bed open Italian sofa), bathroom and kitchen. Furnished to the full. The location of our suite is a prime location (Quiet, central and 1 minute walk to the beach) - 5 Ness-Tsiyona Street. 13 minutes: Neve Tzedek. 8: Dizengof st., Rotchilde Blv. 7: Sheinkin st. 6: Bezalel Market. 5: Carmel Market., Nachlat Benyamin, Kerem HaTeimanim. 1: Alenby st, Yarkon st, Ben-Yehuda st. , Beach, Opera Tower. Surface area : 75 m2/810 sqft, 3 rooms of which 2 bedrooms, Balcony ? (8 m2), Full Kitchen, Living room with dining area and bathroom. Mattress, 15 m2/160 sqft. and large closet. Mattress, 10 m2/110 sqft and small closet. Living room: Open double bed Italian leather sofa with thick mattress. Tel-Aviv: As a major Mediterranean center, Tel-Aviv is a magnet for international tourism. Tel-Aviv has been called 'the city that never sleeps' due to its thriving nightlife and 24-hour culture. Tel-Aviv is celebrating 100 years these days !! The city has a wide variety of restaurants offering traditional Israeli dishes as well as international fare. More than 100 sushi restaurants, the third highest concentration in the world, do business in the city, and an Italian restaurant in Tel Aviv was called the best Italian restaurant outside of Italy by the Italian Ministry of Agriculture. crowded narrow alley with long line of colorful stalls standing on either side, and where vendors proudly (and loudly) presenting their goods. Here you can find almost anything imaginable for the lowest prices in the city, from different kinds of bread and pastry to delicious olives. Beaches: Banana Beach. This is a great beach. Often, sports events are shown in the evening on a screen. The beach is inviting and very popular with hip mothers and the bohemian crowd. Great place to meet people, play backgammon, relax and read a book. The staff is nice and friendly, good looking too. During the summer there are movies shown here on a huge screen free of charge. summer there are sometimes parties and events on the beach itself or nearby and in the winter people can enjoy a walk down the beach and watch the waves crushing over the wave breakers. For a bit of sportive activity, try the volleyball court just off Gordon Beach, and for a touch of amusement for kids, try the beach playground off Frishman Beach. Hayarkon and Herbert samuel streets by the beach. On a hot sunny day it is a perfect place to take a break in a cool air conditioning environment. The Tower has several restaurants, music and bookstores. On the first floor there are also cinemas. The sunsets from the fountain at the Opera Tower in the evening are beautiful. Shenkin St. is one of the most popular streets in Tel Aviv, either for shopping or just for a coffee or light lunch. The street is full of shops and cafés. Many Israeli designers have small shops there. Whether you are looking for a smart suite or presents for your kids, you will have a wide selection on this street. Sheinkin St. is mostly recommended to go on Fridays, as there's a lot happening !! Lots of people all over, Music (mostly when the weather is good which is most of the year), Lots of nice cafes, nice shops and great atmosphere. Walking distance locations in minutes:(Ness - Ziyona St.) 13 minutes: Neve Tzedek. 8: Dizengoff st., Rotchilde Blv. 7: Sheinkin st. 6: Bezalel Market. 5: Carmel Market.. Nachlat Benyamin., Kerem HaTeimanim. 1: beach, Opera tower., Alenby st., Yarkon st., Ben- Yehuda st. 0: Suite - Sunrise - Start your count down for your next vacation. Being just one block to the beach was wonderful - we would wander down there multiple times a day (something that wouldn't happen if you were even a 2 or 3 blocks further inland). The apartment itself (# 11) was great: spacious and very clean. The balcony with a side view of the Mediterranean was lovely. Two small couches were plenty of room for 3 of us to sit and enjoy the sunset. Lots of great restaurants nearby. And included parking was a bonus. 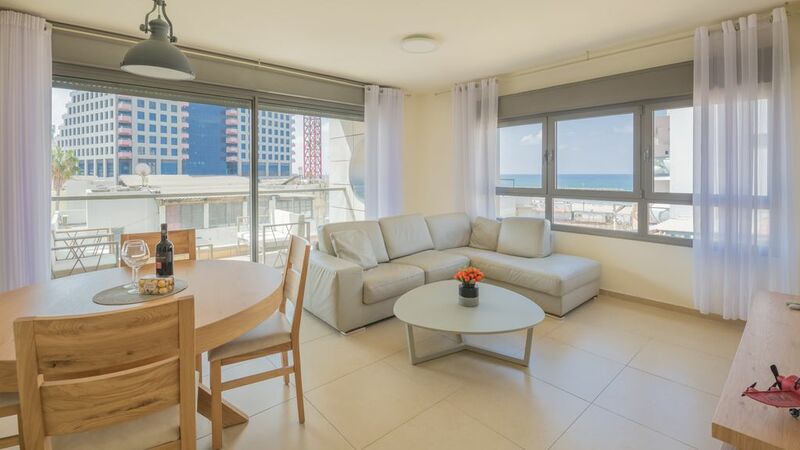 As per advertisement, the apartment had been rather convenient for what Tel Aviv has had to offer visitors. Walking distance to an open market, mini stores for necessities and convenient transportations to varying destination—to mention a few. I admire the county’s efforts in securing safety to the public, and the diligence to enforce them through. If I may suggest something regarding goods at the grocery stores—to at least have the name of products in English for those of us who do not speak or read the county’s language. It was embarrassing to bother someone to find butter or the right kind of milk. Thank you for a memorable visit. Clean and fully furnished appt in a modern building, quiet and you will appreciate the Parking space too. Owner is friendly hosting people, Always there, or represented if there is any question. Perfect central location with All amenities you need. All redone. Balcony with a nice view , beach at walking distance 1 minute .Very Clean .Confortable Bed and pillows. Manager Ronen totally available to help . It will be my 5 th time this year! Good location, close to everything, parking was great and a wonderful extra considering how difficult it is to park in Tel Aviv. This organization owns 10 apartments in the same building, as I read the prior reviews, I have to wonder if I received the apartment which needed the most help?--My two bedroom apartment showed a lot of wear and tear, the mattress very thin, pillows with plenty of prior use, shower head leaked at the junction spraying water to the back wall, the living room sofa--broken at the head rest. Quite minimalistic in every respect. It is amazing how some owners make sure that your first night there is convenient and easy by providing bath soap ( a little hotel soap bar would do) and perhaps one little bit of coffee for the morning?--this organization did none of the above, all I saw was toilet paper. I had minimal communications with the owner or management, it is what it is--however, the apartment was nothing as depicted in the photograph promoting the place. For some reason getting the security deposit in a timely fashion was another issue---it takes about 3 weeks, why? I am happy you liked the location and that the apartment was as described. I am sorry you had a few issues that you did not like, however if you had told us about it during your stay we would have fix everything to your satisfaction. The deposit is usually returned after a 2 - 3 weeks once we are sure no damage was done to the apartment. We found that not always we discover all damages immediately. We returned your deposit after 18 days. We are self catering apartments and as such we do not supply soap or coffee for more than 1 or 2 days of stay. We just put a few things to get you started. We had 35 text massages on whatsapp before during and after your stay in 8 different days but I only heard about all this after your stay which is very unfortunate since we could have fix everything pretty fast. This is a lovely apartment in a great location! We enjoyed our stay here very much.